"K-Experience Culture Complex" To Replace KAL's Songhyeon-Dong Project. Really? 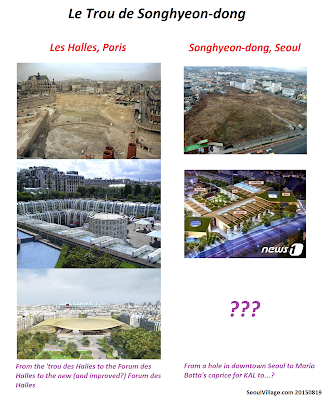 The Songhyeon-dong drama reminds me of the 'Trou des Halles' feuilleton in Paris. In both cases, a massive lot in the dead center of the capital remains empty for years while all stakeholders debate over its purpose. 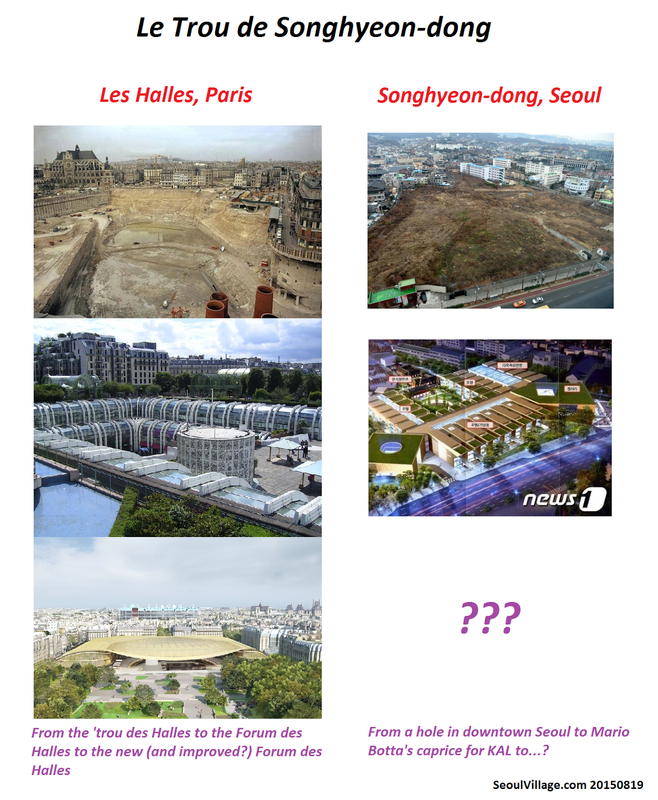 I wish a better ending to Seoul than the site of the former Paris wholesale market: then mayor Jacques Chirac opted for the behemoth of an urban mess that to this day cripples the city center (under renovation, Le Forum des Halles will reopen next year). 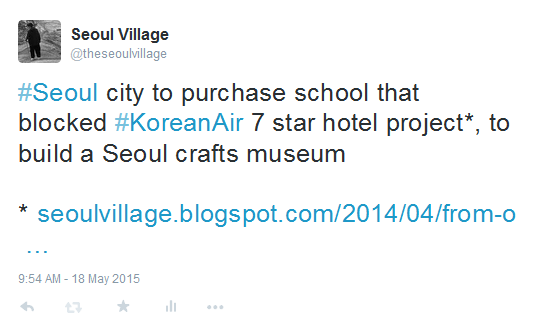 Korean Air wants to build a 7-star hotel on prime land, the 30,000 sqm site formerly used for US Embassy staff in Songhyeon-dong, between the Gyeongbokgung and Insadong. 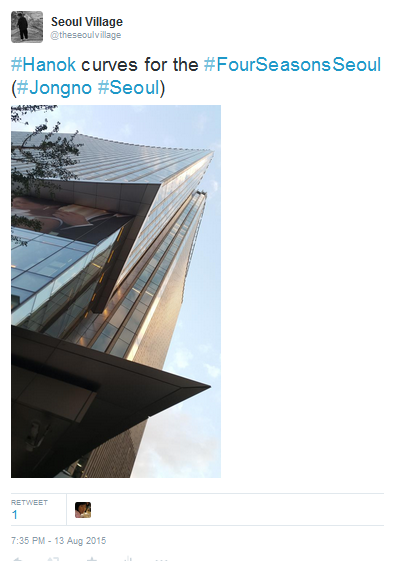 To tame conservationists opposed to the project, KAL pledges to give it a 'hanok-ish' look. But the main hurdle is legal: regulations forbid certain activities in the vicinity of schools. Intense lobbying to move the school and change the law ensues. Authorities seem trapped by binding engagements with Hanjin. Politically, they cannot let KAL do what they want, or they would face public outcry. But at the end of the day, behind the cultural alibi, the group must somehow get some decently fat cash cow to milk. This "traditional" "K-Experience Culture Center" is a classic gimmick for empty cultural shells build in downtown Seoul, and I don't think that at this stage authorities have more clues about how they will fill it than they do for the similar hanokish traditional center planned across Changdeokgung (see "Gwanghwamun, Donhwamun, and the Tale of two Royal Roads"). Expect some tribute paid to long-gone Choseon landmarks. Worse: the "K-Experience" part has the sirupy "hallyu" flavor Korea must ASAP stop spreading all across its cultural spectrum (see "Heralding cultural diversity - a stronger and more sustainable Korean Wave"). That's more like the "classic gimmick for empty cultural shells" built on the other side of the river (BTW yet another kpoop / kdrama center has been announced near Jamsil). * e.g. 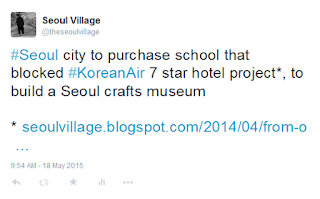 "From The Outside, KAL's "7 Star Hanok Hotel" Showcases Excellence in Freight", ""Korean Air Grounded : Seoul 7 Star Hotel Delayed"